How many medals does it take to weigh down a brewery? That sounds a bit like a trick question, doesn't it? Lucky for us, our brewery walls are old and as strong as they come, with the backbone to withstand the weight of a few shiny pieces. Adding new medals to the walls feels a little less like victories and more like a collection of history, a story of where we've been and a reflection of who we are. Never setting out to win an award, but to make great beer that will be well-received by casual beer drinkers and critics alike, these medals are indications that we're on the right track. We're doing what we've set out to do, and each medal helps give shape to the trail we're blazing. Our newest addition to the collection, a gold medal for our 'Batch 6000' Baltic Porter, in the Baltic-Style Porter category, makes 50 pieces of hardware from the North American Beer Awards, (NABA; presented by the North American Brewers Association), on our walls. We are grateful and excited about this addition, not only due to the prestigious recognition, but because this particular brew was our 6000th batch of beer since opening in September 1995--a milestone of great lengths! Having had his hands in thousands of batches of Boundary Bay beer over the years, Aaron’s ridden the tides as they’ve ebbed and flowed. He recalls years we won 11 awards from NABA and years we came home with zero. As we've seen the beer industry change and develop from living room brewer set ups to nearly a dozen open breweries in Bellingham, much like the ever changing waters of the sea, a NABA Gold confirms: Boundary Bay, with the stern to the wind, and sails and steins full, is steady at the helm and advancing in just the right direction. Looking back at other NABA awards that have helped signify milestones, Brewer Bryan Krueger recalls the sense of accomplishment when awarded a NABA gold for The Nautilus in 2016. A brand-new style of beer for him, and for Boundary Bay Brewery, Bryan could chalk up the win to 'beginners luck'. Instead, he found validation that the two years he put into discovering and studying the unique combination of bacterias that went into the making of the beer, experimenting with the ingredients, writing the recipe, and finally creating what became The Nautilus, was all for great reason. 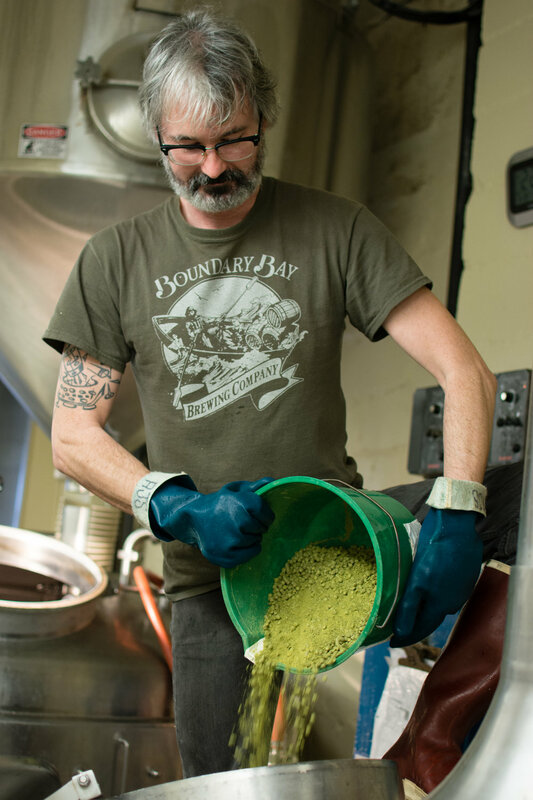 Bryan was indeed on to something when he presented the idea of creating something different for Boundary Bay, and a NABA Gold validated the path our brewers were on. The Nautilus is currently barrel-aging until 2018. We're anxiously anticipating the day those barrels are cracked and we can invite you to enjoy what is sure to be an even more complex, tasty version of the gold that is The Nautilus. If you haven't yet had the pleasure of tasting ‘Batch 6000’, a deliciously dark and chocolately brew, you still can! 'Batch 6000' is a high-octane Baltic Porter cold-fermented with lager yeast that'll excite the palate with notes of stone fruit, vanilla and hazelnuts that are complemented by a rich and chocolatey finish. It is available in the taproom for a limited time, and a worthy cause for a trip to Boundary Bay Brewery.